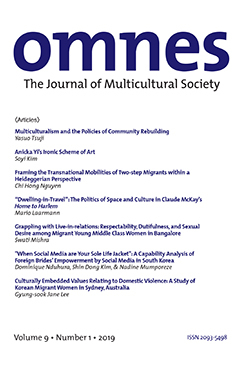 OMNES: The Journal of Multicultural Society is published by the Research Institute of Asian Women, a member of the Sookmyung Women's University community. OMNES, meaning “everyone” in Latin, is published biannually in January and July each year. This journal is indexed and abstracted in Korean Citation Indext (KCI). OMNES seeks theoretical or empirical research discussions with an interdisciplinary approach in the area of arts and culture, economy, history, language, literature, philosophy, politics, and society. The editors also invite submissions from researchers in all fields of social science and humanities.